We cover the South East of England including Sussex, Surrey, Kent, Hampshire and South London. 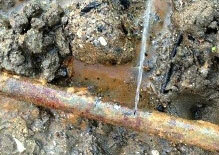 We have a wealth of experience in finding exterior water leaks, repairing burst pipes and water main installation, making new connections to the mains supply pipes and replacing old pipework. Specialising in the Southern Water, South East Water & South Thames Water areas we have emergency plumbers and repairs teams ready to respond quickly to all call outs. By using the latest moling technologies we are able to minimise the need for large excavation works which reduces disruption at your home. Our free water main insurance mediation service will manage claims through your buildings insurance policy and repairs/ replacement can be carried out free of charge to the client (if covered by the policy). Policy excess may apply. The Water Main Company is a Trading Name of Blockbusters Contracts Ltd, part of the Block Group of Companies. Company Reg No. 2992653. * Free Water Main Repairs are subject to a claim through your buildings insurance policy and being managed through our free insurance mediation service. A policy excess may apply.